This Australian flag design is a distinct representation of Australian symbols. The current Australian flag is a British blue ensign defaced with the Southern Cross and the Australian Federation Star. As these two symbols were chosen by Australians as unique symbols for the original flag, it is appropriate that they are retained for the new design. The dark blue field and flag proportions are also retained. In this way, continuity is maintained with the current flag. The seven-pointed Federation Star occupies the canton, the position of honour on the flag. 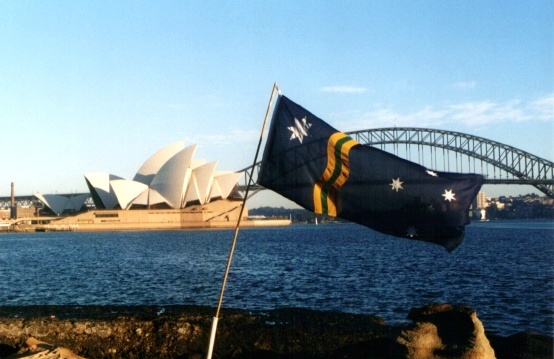 Representing the six original states and all other territories, the star is symbolic of the first time the entire Australian continent was united under one government and is a symbol of Australian unity. The Southern Cross is a popular Australian symbol, acknowledging Australia as the Great South Land. It occupies the same position on this design as it does on the current flag. The new elements of the flag are the three wavy, vertical stripes - gold, green and gold - that separate the hoist and the fly. Green and gold were officially proclaimed Australia's national colours in 1984, and it is appropriate that they feature on the new flag. They are the colours of Australia's floral emblem, the Wattle, that has featured on Australia's coat of arms since 1908. The wavy stripes recall the Dreamtime Serpent of Aboriginal legend, acknowledging Australia's indigenous heritage. 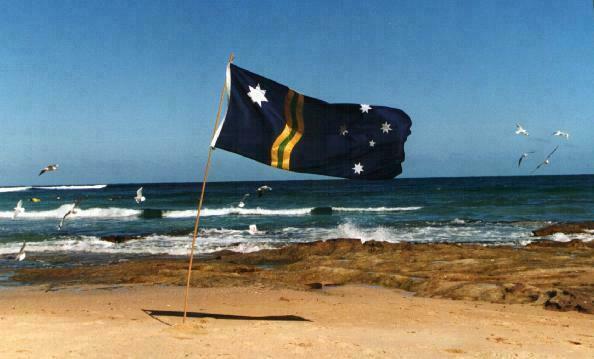 Overall, this design represents an evolution from the current flag and is unambiguously and proudly Australian. Click on the picture for a larger image. Photographs by Geoff Kelly. Southern Cross: The stars of the Southern Cross are exactly the same size and feature in exactly the same position as they do on the current flag, as defined by the Commonwealth Flags Act (1953). Commonwealth Star: The Commonwealth Star is the same size as it appears on the current flag. In this instance however it is positioned in the upper hoist of the flag, its centre line across the flag 1/7 the length of the fly. The top of the Commonwealth Star is level with the top of the Southern Cross. Stripes: The left edge of the stripes touches the top and bottom edges of the flag 1/3 of the distance across the fly. The wavy line traces part of the circumferences of five circles, with diameter half the height of the flag, arranged with edges touching as per the diagram below. The width of each stripe is 1/30 the length of the fly.